Mortgage News Digest: 4000.1 Revisions Making Your Teeth and Hair Hurt? 4000.1 Revisions Making Your Teeth and Hair Hurt? As we reported earlier, there should be no real surprises in the 9/14/2015 4000.1 release. The only area that seemed to cause some alarm related to the pre-closing audit rigor. If you are a Quality Control Plan customer of ours, you know that we have ALWAYS recommended this as a standard process. If you originate 100 loans, you must audit 10 (in addition to ensuring that you capture all sources in an audit cycle). Of that 10, 1 may be a pre-closing/in-process random audit. It seems like chicken and egg, but you have to look back at your total audit percentages to make the determination that you have conducted enough pre-closing/in-process audits. Here is a sample policy that addresses 4000.1 Requirements for your QC Plan. The requirements listed in Quality Control Plan requirements are referenced below as to how we comply in our procedures. In general, the 9/14/2016 Update to the HUD/FHA Single Family Handbook re-organized standards into a new format referred to as the 4000.1 Revision. Although HUD’s requirements for quality control did not change substantively, the new policy manual opens QC reviews to a broader definition, by referring the examiner back to the Underwriting or Delivery requirements. Single elements no longer get addressed as minutiae, rather the entire guide is incorporated by reference. A reiteration of HUD/FHA QC Review Area. This shows with some clarity that the scope and scale of "In-Process/Pre-Closing Review" is the same as the Post-Closing Review. We have located specific elements queried by examiners in the QC Plan for ease of reference. Please note that terminology may vary with all of the variation between industry standards regarding the Pre-Closing, Pre-Funding and In-Process reviews. The terminology is so close as to cause confusion among lenders and reviewers. · Pre-Funding reviews refer to the review of Loan Quality Initiative and similar fraud detection elements conducted on EVERY loan before it closes. · Pre-Closing/In-Process reviews refer to the concealed selection of individual loans in process to identify potential fraud within the production process. · 10% of ALL audited loans should be sampled. Example: If you fund 100 loans, 10 total loans should be audited and 1 should be pre-closing audited. · Loans PRE-CLOSING AUDITED do NOT have to be re-audited post-closing and count toward the 10% of ALL LOANS audited. · The ONLY DIFFERENCE between the pre-closing and post-closing audit is that the reviewer does NOT HAVE TO WAIT for re-verifications to come in. We still request third party verifications, but we do not have to wait to close the loan. 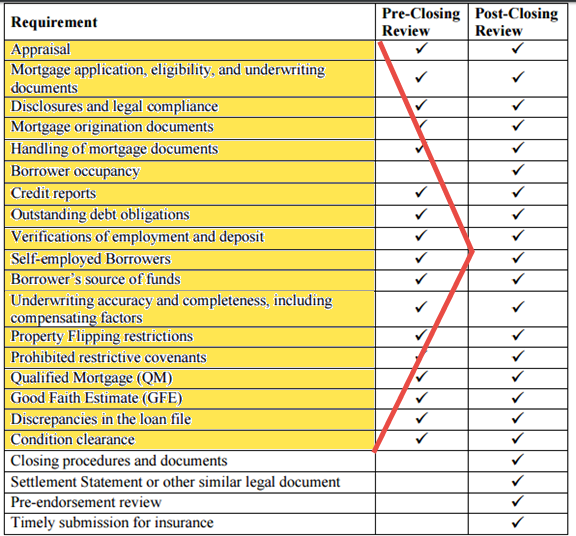 · Post-Closing Audit is the full scope audit conducted by lenders and delegated correspondents. Unlike Pre-Closing/In-Process Audits, Post-Closing Audits MUST WAIT for Third Party Verifications before completing review.